JEDEDIAH SMITH MILLENNIUM EXPEDITION - "A RENDEZVOUS WITH HISTORY!" The "Jedediah Smith Millenium Exploration" is an upcoming public awareness event initiated by the National Coast Trail Association. It will not only strive to highlight the historic significance of Jedediah Smith, but also remember and honor Native Americans and their rich cultural heritage, and appreciate the unique scenic beauty of the south coast. The plan calls for their executive director, Al LePage, as "Jed Smith" and dressed as a mountain man, to hike up the southern Oregon coast and literally "rendezvous with history" by essentially traveling the same approximate route on the exact historic dates, and for the same distances and in the same areas as the Jedediah Smith's expedition did in 1828! It will provide the kind of direct field experience that can potentially serve as the basis for serious research and scholarship about Jedediah Smith especially during the 1828 expedition up the Pacific coast, and his encounters with Native Americans. Indeed, it has the potential of literally becoming a historic event in its own right for at least three reasons. First, it would be the first time retracing the 1828 expedition has apparently ever been attempted along this section of the west coast during the same historic dates as the original expedition. Second, as expected, having the event itself has lead to the designation of the Jedediah Smith Trail as a Community Millennium Trail. Third, it represents a conscious and coordinated effort to offer residents and visitors alike a chance to learn about and connect with their land, their history, and culture using the Jedediah Smith Trail as the common thread to do so. The series of public events given in conjunction with LePage's hike will provide a once-in-a-lifetime opportunity having the potential to foster a unique and deeper understanding not only of Jedediah Smith and his significance in history, but also of Native American perspectives and, thus, a more accurate knowledge of history. Let's Travel Back In Time . . . This is where the story of Jedediah Smith as a mountain man begins.
. Saint Louis - Wednesday, February 13, 1822 . Enterprising Young Men The subscriber wishes to engage ONE HUNDRED MEN,to ascend the river Missouri to its source, there to be employed for one, two or three years.--For particulars enquire of Major Andrew Henry, near the Lead Mines in the County of Washington, (who will ascend with, and command the party) or to the subscriber at St. Louis. "Enterprising young men, as General Ashley well knew, were a specialty of St. Louis. The ad did not specify how the hundred young men were to occupy themselves on the sources of the river Missouri, nor did it have to. One thing only had made St. Louis the largest and most thriving town on the frontier: the fur trade of the Far West. That trade had made fortunes for some and ruined others, but there were few in St. Louis whose well-being did not in some way depend on what was happening up the great rivers." Thus, states Dale Morgan in his book Jedediah Smith and the Opening of the West. This ad began the career of Jedediah Smith and eventually led him to an exploration of the West overshadowed only by Lewis & Clark! Actual journal entries made by Smith about this time in his life later noted . . . "In the spring I came down to St Louis and hearing of an expedition that was fiting out for the prosecution of the fur trade on the head of the Missouri by Gen Wm H Ashley and Major Henry I called on Gen Ashley to make an engagement to go with him as a hunter." Dale Morgan also notes in his book that . . . "The young man who came knocking on General Ashley's door received a warm welcome, for reliable men were hard to find this spring. The General's caller was a lean young fellow, brown of hair and blue of eye, perhaps six feet tall, who talked with a self-possession that belied his twenty-three years. Serious of mind if not entirely humorless, there was a quiet passion in him which would emerge in the course of an hour's conversation. He proposed going to the mountains to make himself a first-rate hunter, thoroughly acquainting himself with the character and habits of the Indians, tracing out the sources of the Columbia and following the great river to the sea. But also, practically, seeing to it that all this was profitable to himself." This suggests Smith envisioned himself not only becoming a hunter but also exploring the west all the way to the Pacific itself! Over the next 10 years of his life he not only realized this vision, but far exceeded it. In late summer 1826 Smith and a party of men set out on the South West Expedition by riding into the valley of the Great Salt Lake. They eventually reached the California coast, and became the first white men to arrive there by traveling across the inland deserts! Smith needed to make a rendezvous near the present-day Idaho-Utah border, and in 1827 left California to become the first white man to cross the High Sierra to get there. On July 13, 1827 Smith and his party of men headed for California, and after arriving spent months being detained by the Spanish authorities to eventually leave on December 30, 1827 to continue the business of trapping. At this point Morgan notes . . . "A large spring hunt could hardly be hoped for, Jedediah had only forty-seven traps left, and a steady wasting of these would come through loss, breakage and theft by the Indians. The young American would not have risen so far and so fast, however, had he not been of a resourceful turn of mind. A large part of the money realized on the sale of his furs he had invested in horses and mules, 250 of them at ten dollars apiece, which added to the sixty-five horses he already possessed, gave him an imposing caballada. 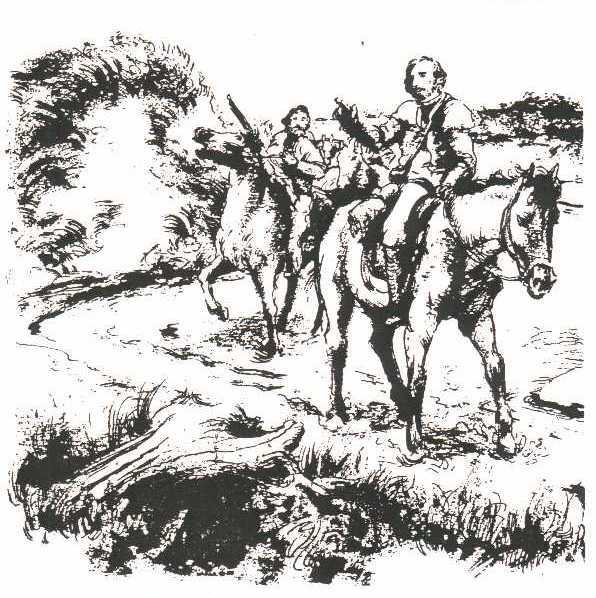 Jedediah proposed to drive these horses back to rendezvous and dispose of them to the free trappers; they would be worth a minimum of fifty dollars apiece, delivered in the mountains. Thus Jedediah was pioneering in another field of enterprise; he was opening the continental trade in California horses." Smith and his men struggled on and by May 19th, 1828 they finally had their first view of the ocean. It was not until June 8th, though, that they finally reached the Pacific, coming out at the mouth of Wilson Creek, near present-day Requa, California. However, the struggle continued as they moved up the coast over steep ridges and through timber and brush until reaching present-day Crescent City, California. On June 20th he crossed the mouth of a major river, the now Smith River of California, and entered Oregon on June 23rd, 1828. Smith and his party traveled up the coast and became the first white men to do so below the Rogue River, near present-day Gold Beach, Oregon. They reached the now Smith River of Oregon by July 13th; the next morning while still encamped there Indians attacked and killed most all his men, putting an end to the 1828 expedition. Smith, however, (and three of his men) survived, and he went on to explore other areas of the west during his brief lifetime. This is where the Smith story ends, and where our story begins. Enterprising, passion, vision, resourceful, explorer, first-time, perserverance, pioneering -- these are some of the words that describe Jedediah Smith -- and, we believe they also describe the National Coast Trail Association and our upcoming Jedediah Smith Millennium Exploration! We passionately pursue our mission of "Keeping The Coast For Everyone" through participation and education for trails, public access, and coastal preservation. We area a non-profit with limited resources and need to be resourceful and perservering to carry out this mission. Therefore, we envision an enterprising and pioneering first-time event to promote "A Rendezvous With History" along the southern Oregon coast -- The Jedediah Smith Millennium Exploration! Indeed, there will be many opportunities for the public to meet with "Jed Smith" along the way, and "Rendezvous With History!" This is where our story ends, and perhaps where your story begins. Just 'Click-on' . . .
1. THE "PUBLIC EVENTS CONNECTION"